Camille Pissarro’’s painting Rue Saint-Honoré in the Afternoon, Effect of Rain, 1897, hung in the parlor of the Cassirer family home in Germany before the Nazis seized it in 1939. In a trial more than a decade in the making, lawyers at Boies Schiller Flexner and Nixon Peabody are set to square off starting Dec. 4 in a Los Angeles federal courtroom for three days to decide the fate of a Nazi-looted painting by French impressionist Camille Pissarro. A Boies Schiller team led by David Boies himself and Miami-based partner Stephen Zack will make the case that the descendants of Lilly Cassirer Neubauer are the rightful owners of Pissarro’s “Rue Saint-Honoré, après-midi, effet de pluie.” Neubauer, the great-grandmother of the Cassirer plaintiffs, lost the painting in 1939 after a Nazi-appointed art dealer seized it to conduct an appraisal and valued it at the modern equivalent of $360. The masterpiece since has been appraised at more than $30 million. Camille Pissarro’s painting Rue Saint-Honoré in the Afternoon. Effect of Rain, 1897. (1976.74), at the Museo Nacional Thyssen-Bornemisza in Madrid. "The principle involved here—that no person should never be able to hold good title for a property that has been looted—is a critical principle in today’s world,” said Boies Schiller’s Zack in a phone interview. On the defense side, a Nixon Peabody team that includes art law expert Thaddeus Stauber is set to represent Madrid-based Thyssen-Bornemisza Collection Foundation, which is tasked with managing a collection of art acquired by the Spanish state, including the Pissarro at issue. The Foundation’s legal team has argued that under Spanish law it is presumed to have acquired the painting in good faith. Likewise, the defense also argues Baron Hans Heinrich Thyssen-Bornemisza, the Swiss magnate who previously owned the painting, has that same good faith presumption under Swiss law. The plaintiffs, the Nixon Peabody lawyers claim, don’t have evidence showing that either the Foundation or the Baron acquired the painting with knowledge of its Nazi-looted past. Because Plaintiffs’ ‘evidence’ does not suggest, much less prove, that the Foundation had actual knowledge of the Painting’s wartime looting until Mr. Cassirer’s 2001 petition, the Foundation cannot, under any legal theory, be deemed an encubridor,” wrote the Nixon Peabody lawyers, referring to the Spanish legal term for for accessory to a crime. Haynes and Boone, who wrote an amicus brief for Bet Tzedek Legal Services backing the Cassirers in the case when the case was on its most recent—and third trip—to the Ninth Circuit on appeal, said it’s “a rarity in the realm of Holocaust art restitution”: A case that is actually going to trial, rather than being decided on sovereign immunity grounds or under some statute of limitations. Now it will be up to U.S. District Judge John Walter in Los Angeles to decide whether the Baron and the Foundation held good title to the painting and whether the Foundation knowingly received stolen property. Some of the key evidence in the case lies in a location where folks outside of the art world probably wouldn’t think to look: The back of the painting. The Nixon Peabody lawyers note that the Pissarro lacks the markings from Nazi agencies and suspicious customs stamps that are often “red flags” for looted art. The Boies Schiller lawyers, on the other hand, point out in their trial brief that the back of the painting had evidence of numerous removed labels. On top of the missing labels, the Boies lawyers point to one partial label that remains: a torn gallery label that says “Berlin” they claim irrefutably ties the painting to the Cassirer Gallery. There was no effort to really look at the provenance here” by the Baron or TBC, said Boies Schiller’s Zack in a phone interview. The Foundation’s lawyers, however, say that the label is not sufficient evidence to overcome its presumption of good faith. 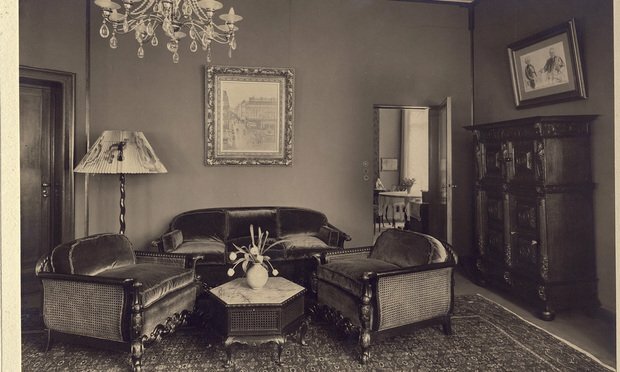 The defense lawyers argue that even if that connection were made, there’s no reason to connect that gallery, which they say closed in 1901, with Nazi looting or Lilly Cassirer Neubauer. But the Boies lawyers say that what’s at issue isn’t whether defendants knew that painting was taken from Lilly Cassirer Neubauer. The issue is whether the Baron and TBC knew the Painting had been stolen, full stop,” they wrote.